Flagship Merchant Services is one of the largest credit card industry ISOs (independent sales organizations, which act as a 3rd party between a merchant and an acquiring bank that receives the credit card transactions). Under their corporate name of CardServ Inc., they are headquartered in Charleston, MA, and were established in 2001. They focus on payment processing solutions for small- to medium-sized businesses. This website, Creditcardprocessors.net, is a report and a survey of a sampling of companies that offer merchant credit card account services. We have attempted to compile useful information in a convenient table form for ease of understanding and for making comparisons on fees and related data. 4) We offer “Our Final Conclusion” and recommendation about the company. One thing to keep in mind about these or any credit card processor, advertised rates and fees are just one element that should go into your decision for selecting a merchant credit card payment processor. The difference in some rates or fees overall in a month might only be a matter of a few dollars, depending on your sales and transaction volume. The Discount Rate (the percentage of a sale the processor retains as part of their compensation) is figured in a number of ways; most often the operational model is “3-Tier Pricing.” In this frequently used model a merchant’s transactions will be broken down into 3 categories (“qualified,” “mid-qualified” and “non-qualified”). Many of your transactions might not qualify or they may be judged ineligible for the lowest stated (“qualified”) rate. Matters such as technical support, customer service, and services and products that are uniquely important to your particular business or mode of processing transactions are at least of equal or greater importance as rates and fees. Although we have tried for accuracy in these reviews, the information is subject to correction and change. If you notice something or want to be in touch or offer a general comment or your personal experience with the credit card processors, please do so. Some statements we have made about a number of the companies presented here have been based upon some of the complaint websites. These websites provide a number of insights and reports on an actual merchant’s experience with a processor. Bottom line is to not rely on a salesman’s verbal promises, but to get things in writing, read and understand the fine print of contracts and know exactly what you’re getting yourself into. Any fee or rate can be stated. Whether that fee is adhered to is something to also consider in one’s evaluation of a company as a potential supplier of this very vital part of your business or planned business. Cancellation or early termination fees must be paid attention to. Contract duration—what is it? Whether equipment can be purchased or leased are other matters, and what are those terms and conditions? Are monthly statements easy to understand? Do they match up with your bank statement? Are there double charges or unwarranted charges? Are fees being withdrawn for no reason? Are there annual fees? What is this PCI (Payment Card Industry) compliance fee? Is that standard and usual? Credit card processors differ, but they’re all competing for your business. And a merchant account credit card processor really does belong in your business. Businesses who offer credit card transactions are providing customers with one more very important way of connecting with their business, and purchasing good and services. Today, it’s practically a basic and offers convenience to your customers and an enhanced shopping experience. Companies that add credit card processor services invariably find their sales volumes go up. And that’s all the more reason for making an informed decision on a credit card processor. You don’t want to erode or leak hard-earned profits, for all credit card processors are not alike. You can see, we have rated Chase Paymentech our top choice, but there are also other excellent companies we have reviewed on this site. So please review the companies we have profiled here at Creditcardprocessors.net. Let this serve as a guide, a point of departure for you to do your own due diligence in making a selection of a company for providing this vital service for you and your customers. 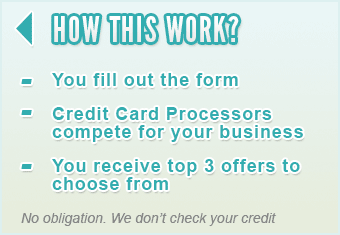 Thank you for visiting Creditcardprocessors.net. Whether you are a startup, a new merchant, a merchant in business for awhile, or someone contemplating opening a business, we want to wish you the best of luck—and also to say luck can happen from hard work and doing your due diligence, including a review of best vendors. And that would include a credit card processor.